There is a well known Lag Ba'omer custom for children (and adults!) to play with bows and arrows. It is said that the Scriptural source for this custom is alluded to in the verse: "And the sons of Ulam were mighty men of valor, shooters of bows and had many sons, and sons' sons." Based on this verse, Rabbi Nachman of Breslov teaches that playing with bows and arrows is a segula for having children. It is explained that playing with bows and arrows on Lag Ba'omer commemorates that during the lifetime of Rabbi Shimon bar Yochai no rainbow was ever seen in the sky. This is because the rainbow, which represents God's protection over the world, would have been superfluous, as the merit of Rabbi Shimon bar Yochai served this purpose instead. The Hebrew word for bow, "keshet" is also the same gematria as "Rabbi Shimon Bar Yochai". Another reason offered for the bows and arrows custom is in order to recall the Roman decree which prohibited all Torah study. Rabbi Shimon bar Yochai and his students would trek to the forests equipped with their bows and arrows in order to study Torah there. When confronted and questioned by the Roman policeman as to what they were doing in the forest they would answer that they were simply on a hunting trip. 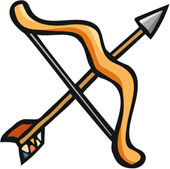 Similarly, the military nature of bows and arrows are intended to recall the revolt against the Romans in 135 C.E. This revolt was led by Rabbi Akiva who was the primary teacher of Rabbi Shimon bar Yochai which further strengthens the connection between Lag Ba'omer and bows and arrows. The Lubavitcher Rebbe explains that the bow and arrow represents a person's diligence and success in Torah study. The archer knows that in order for his arrow to reach its target far off in the distance, the more he must draw the string inward towards himself. The more he bends it, the further and faster the arrow will fly. So it is with Torah study. The more effort one invests in Torah study the more one will succeed and "go far". He also notes that the archer positions the bow and arrow close to his heart, so too, one must ensure that Torah study always remains close to one's heart. Legend has it that the Rebbe, Rabbi Yehuda Tzvi of Startin, would go to the forest with his Chassidim to shoot bows and arrows on Lag Ba'omer. Once, he shot an arrow in the direction of Vienna. It is said that this arrow made its way to the royal palace and pierced the heart of a known enemy of the Jews who was heir to the Austrian throne. This evidently saved the Jewish people from many evil decrees and hardships.